I would like to eventually expand this page to include all classes, I have several that I have started on myself but are not ready for presentation just yet(this is a project for the long dark winter evenings). I have included a list of published drawings and will place a higher priority on classes that have not been published in magazines. Any contributions are welcome. EL line drawing provided by Brian Weinberg, 121k. HO scale line drawings in Railroad Model Craftsman , July 1982. CNJ tracing from George Elwood's web site, contributed by Tom Gardner. Please visit George's Erie Lackawanna and other Fallen Flag and Shortline Railroad Photos. PRR tracings for the N-5, N-5A, N-5B and N-8 are from Robert Schoenberg's web site, contributed to Rob by Tom Gardner via George Elwood. If you are into the Pennsy, Rob has MANY more locomotive, passenger and freight car tracings available on Rob's Pennsy Homepage. 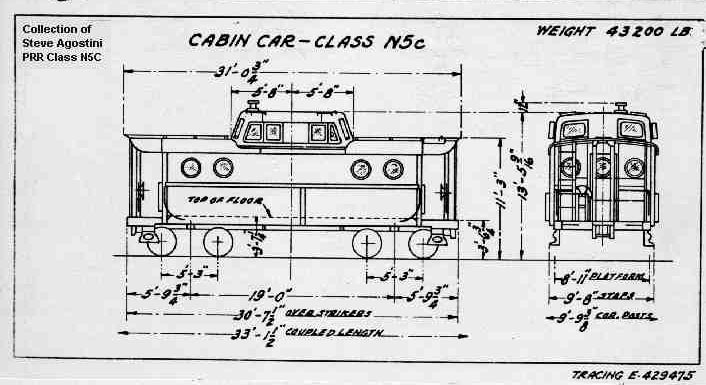 There are also 300 dpi versions of the Cabin tracings available there too! See N-5 for contributor info. PRR line drawings from the collection of Stephen J. Agostini. HO scale drawings in Railroad Model Craftsman , August 1982. NYC tracing found on George Elwood's web site, contributed by Tom Gardner, used with permission. This drawing also refers to N-9 and N-9E series numbers and appears to have been used for all three classes. This drawing(50k) of the N-6A class was created by John A. Isaksen. Copyright with all rights reserved by the draftsman. John also included a photograph(72k) of the car that the drawing was based on, Catskill Mountain 697, ex CR 18015. NH tracings from George Elwood's web site, contributed by Tom Gardner. HO drawings available in Railroad Model Craftsman , October '97, also shows PC/CR N-8B. See NE-5 for contributor info. 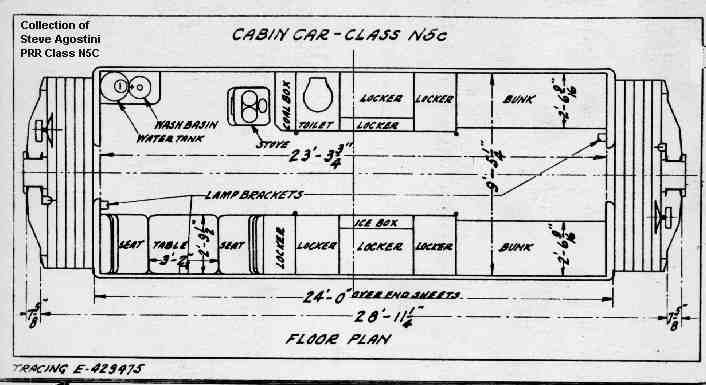 An N-7 drawing from a 1950 NYC plan book(2 years before the N-7A group was built). Field measurements indicate that both classes share many dimensions and may be identical with the exception of where they were built. Found on George Elwood's web site, contributed by Tom Gardner, used with permission. NYC tracing found on George Elwood's web site, contributed by Tom Gardner, used with permission. George Elwood has created this drawing using Corel Draw and Cadkey based on a scan of a drawing owned by Dan Biernacki. Larry Berger had the drawing scanned to create a TIF file that George used as a reference. A DXF file is available on the 'EL Caboose Page' of his Erie Lackawanna and other Fallen Flag and Shortline Railroad Photos. HO scale drawing in Railroad Model Craftsman , December 1972. Railroad Model Craftsman October '97 HO scale, also NH NE-5(PC/CR NE-6). NYC tracing found on George Elwood's web site, contributed by Tom Gardner, used with permission. This drawing also refers to the N-6A series numbers and appears to have been used for all three classes.